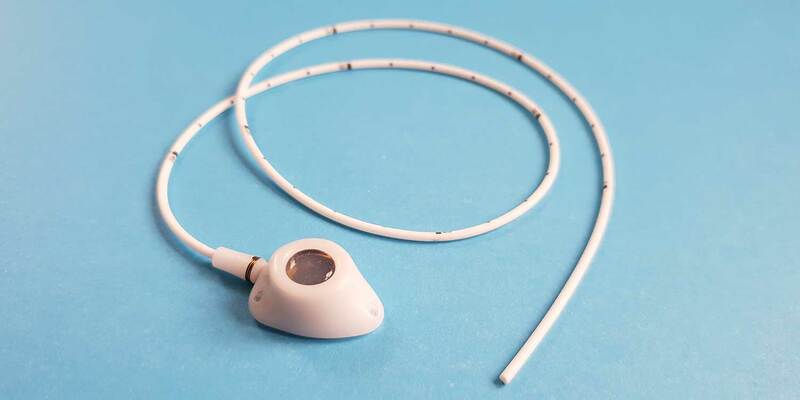 A Portacath (also referred to as Port, Chemoport or Power Port) is an implanted central venous access device (CVAD) recommended for patients who need chemotherapy over several months. The main advantage the Portacath has over the other CVADs is that it is completely covered by your skin so you can shower, bathe or even swim with it in place. 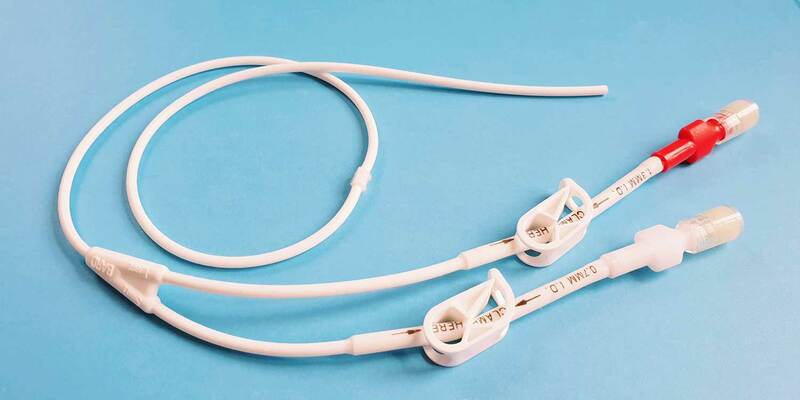 It consists of two parts – an injection port (the portal), which is about the size of a ten pence piece, and a long flexible tube (the catheter). The portal is implanted under the skin in the upper chest and the catheter runs under the skin and enters either the large vein in the lower neck (internal jugular vein) or the vein under the collar bone (axillary vein). 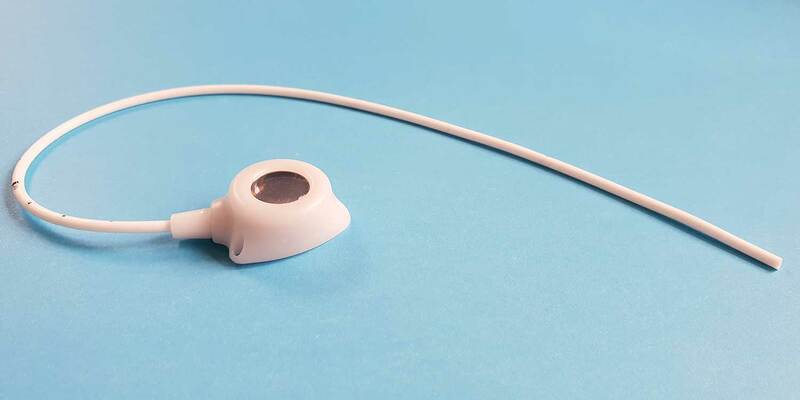 The portal has a septum made of a special self-sealing silicone which can be punctured many hundreds of times so the port can be used for years, if necessary. How is the Portacath used? The skin over the Portacath is sterilized and the port is accessed by puncturing the overlying skin with a special needle (Huber needle). If necessary, anaesthetic cream can be applied to the skin beforehand to make this more comfortable. 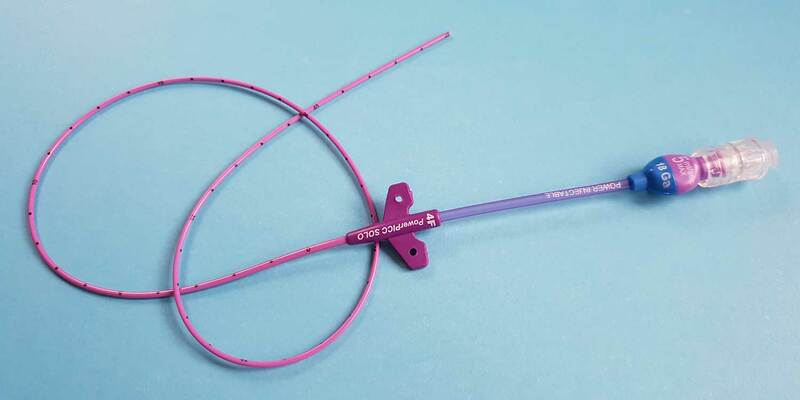 The Huber needle is designed so that it will not damage the silicone septum. Blood is drawn back to check that the port is functioning normally and then it is flushed with saline before treatment can begin. After each use, the Portacath is flushed with saline followed by dilute heparin to prevent any clots from forming. The needle is then removed from the port just leaving a pinprick mark on the skin. How is the Portacath inserted? The procedure is performed under local anaesthetic and intravenous sedation in either the Interventional Radiology suite at KIMS Hospital or the operating theatre at the Nuffield Hospital. Dr Leech will examine the veins using an ultrasound machine to check their position and suitability and then insert a flexible wire into the vein. X-rays are used to check the final position of the port ensuring that the tip of the catheter lies in the large vein just outside the heart. The actual procedure takes approximately 30-40 minutes. Dr Leech usually uses the axillary vein so the procedure can be done through a single 2-3cm incision on the chest wall. However, it is sometimes necessary to use the internal jugular vein and make a second smaller incision (3mm) in the lower neck to access the vein. Dr Leech will discuss this with you during your consultation. At the end of the procedure, absorbable sutures are used to close the wounds so there are no stitches to remove afterwards. These wounds are covered with a water resistant ‘skin glue’ so there are no dressings to change. Typically, most patients go home 60-90 minutes after the procedure. You should arrange for someone to take you home, as you must not drive for 24 hours following sedation. All patients need to have MRSA swabs taken at least 48 hours prior to the procedure. If you are a Haematology patient or have already started chemotherapy you will also need to have some blood tests. If you are taking anticoagulant drugs (blood thinning medication such as Warfarin, Fragmin, Rivaroxaban), these will need to be stopped. Dr Leech will advise you when to stop your medication depending on the drug and the indication. On the day of insertion, you may eat a light breakfast/snack before 9am if your procedure is in the afternoon but have nothing to eat after midnight if it is in the morning. You may drink water right up until the time of the procedure. Female patients should wear a well-fitting bra so that the Portacath can be placed away from the straps to prevent any chafing. You will need someone with you to drive you home afterwards because the procedure is performed under sedation and you must not drive/operate machinery for 24 hours. For two weeks, avoid strenuous activities of the upper limb and chest wall (no golf, contact sports or swimming for 4 weeks) and be careful showering. The skin glue is water resistant but should not be washed vigorously with soap. The wounds should be dried carefully after showering (do not rub them). It is inadvisable to soak in a bath until the wounds have fully healed (approximately 2 weeks). If there are any issues associated with wound healing, persistent redness or soreness please contact your Oncologist, Chemotherapy nurse or Dr Leech’s secretary. It is quite usual for your neck and chest to ache for a few days after the procedure. Simple pain killers such as paracetamol will help relieve this or you can take any other pain-relieving medication prescribed for you. The Portacath needs to be flushed with saline once per month to keep it working (if your chemotherapy is more frequent than this it will be flushed at the same time). When the Portacath is no longer required, it can be removed. This is normally done under sedation and local anaesthetic but is a more minor procedure than the insertion. With modern imaging techniques (using both ultrasound and X-rays), the risk of the procedure itself is minimal. However, there is still a very small risk of blood vessel injury, nerve damage, collapse of the lung and wound infection. There is also the very remote chance of being allergic to the local anaesthetic or the skin glue that is used. Bruising is relatively common especially in patients taking anticoagulant therapy but is normally confined to a small area and resolves within a couple of weeks. Thrombosis is a risk for all patients on chemotherapy and having a Portacath may increase this risk very slightly. If you do experience any sudden onset of pain and swelling in your arm, neck or face, you should contact your Oncologist, Chemotherapy nurse or Dr Leech’s secretary. Rarely the catheter can move within the body and become malpositioned. This is known as migration and occurs more common with PICCs and tunnelled CVCs rather than ports. If a chest X-ray confirms that this has happened, it may be necessary to re-position the catheter. Find out more about the Tunnelled CVC, PICC and Arm Port.